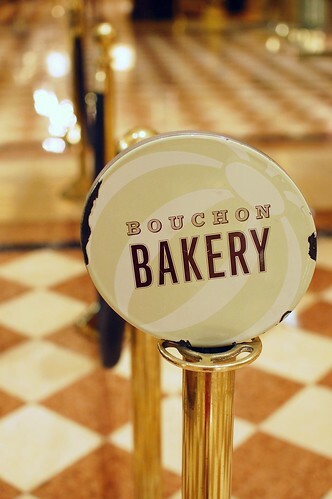 We had brunch at Bouchon at the Venetian during both our December and April trips to Las Vegas. This post memorializes both visits. Note the Christmas tree in the background. Yes, it was December. You will never forget where you are dining. 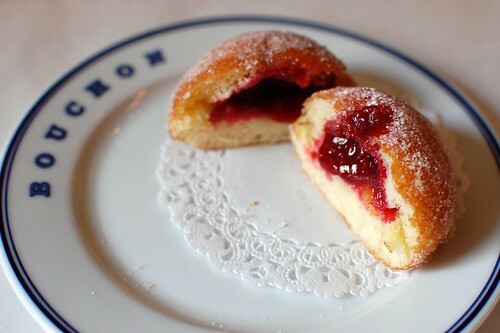 Beignets du jour -- house-made spiced doughnuts with Bouchon Bakery jam and Nutella spread ($7). 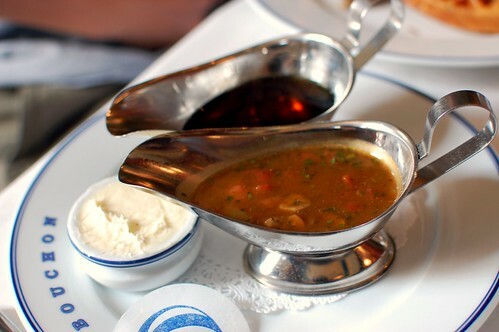 Enjoyable but nothing at all like the hot deep-fried wonders at Cafe du Monde in New Orleans. 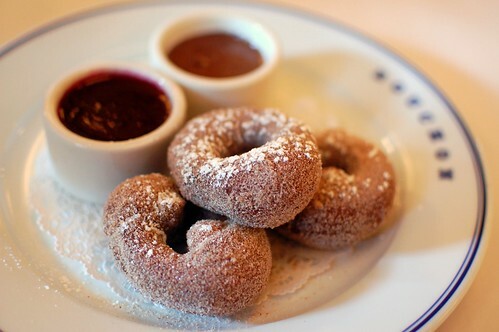 As promised by the menu, these were "just" French spiced doughnuts. If that's what you expect, you'll be pleased enough. I used the Nutella liberally. 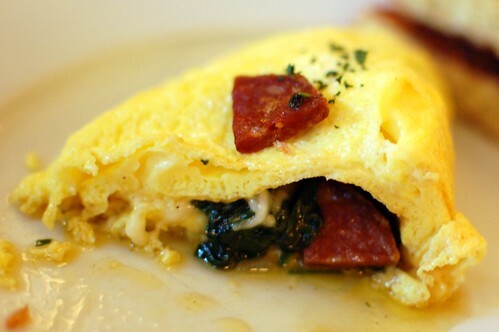 Omelette du jour -- spicy chorizo, spinach, cheese ($17). Simple but lovely. No need for our usual Tabasco for this egg dish. 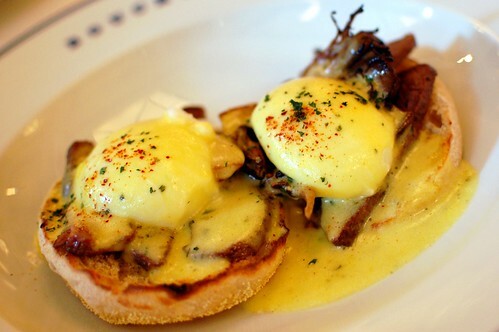 Steak and eggs Benedict ($26.95). Morning decadence on an English muffin. Big fat meaty eggy yum. Side of potatoes accompanying the Benedict. As the Lucky Charms leprechaun would say, these were magically delicious. Like they're-always-after-me-lucky-potatoes delicious. Like oh-my-God-why-are-these-so-good delicious. Like facking-derishus delicious. When the Oros said they had breakfast cravings during our April weekend together, we knew exactly where to go. 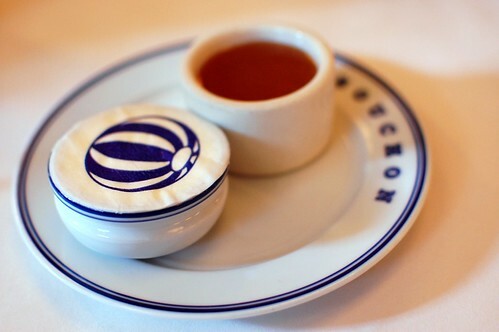 Back to Bouchon! Fancy jelly donuts never tasted so good. 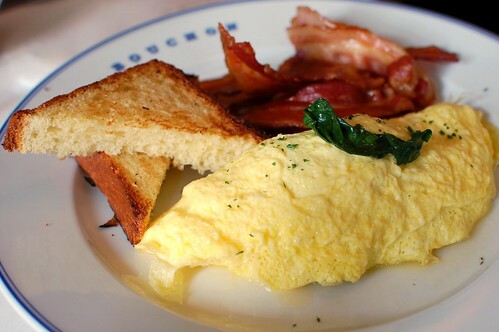 Omelette du jour -- Dungeness crab, cherry tomato, spinach, cheddar ($17). Another hit, although Mrs. Oro did shake some Tabasco on it. 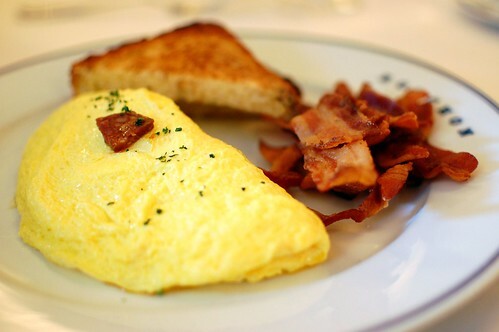 Bouchon's version of a Grand Slam -- way more awesome than Denny's version, as it should be, given the price. 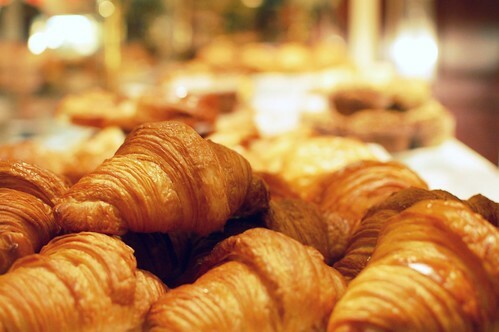 We all shared Mr. Oro's strawberry croissant, which was more like a crumble than a croissant. Crumble, croissant, who cares? It was the equivalent of breakfast candy, and that made us all very happy. Chicken and waffles -- roasted chicken, bacon and chive waffle, Tahitian vanilla bean butter, Sauce Chasseur, maple syrup ($25). I liked Mr. Monkey's dish the most. The chicken was exquisite -- so juicy, tender, and well-seasoned. Loved it with the Sauce Chasseur, but it didn't even need it. The waffles were the star, though. Slightly salty and paired with Vanilla butter and syrup, they were perfection. 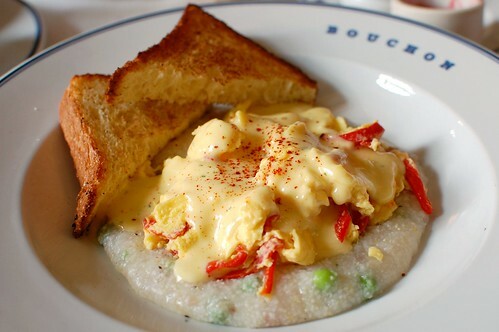 Oeuf du jour -- creamy grits, prosciutto, English peas, piquillo peppers, scrambled eggs, fine herb Hollandaise ($26). When I see grits, I order grits. These may have been the hoity-toity-est grits I've ever had. 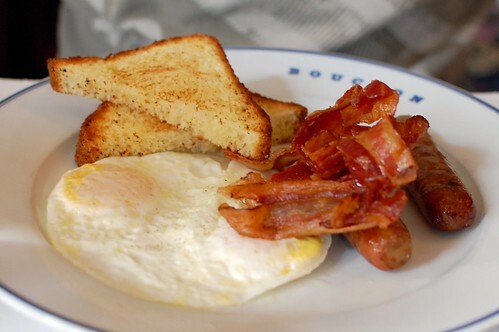 And, in case you don't speak French, oeuf du jour means "egg of the day." Good stuff, but the chicken and waffles stole my heart. 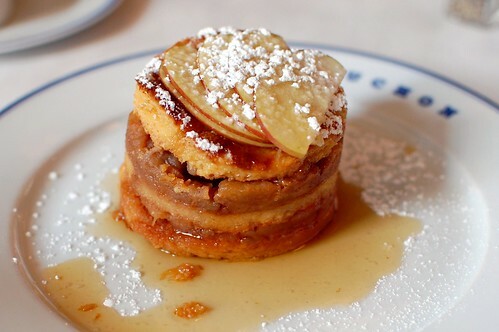 Bouchon French toast -- bread pudding-style with warm layers of brioche, custard, apples, and served with maple syrup ($12). You can get this as your meal, but we opted to share one for dessert. Genius! I think it would be far too sweet for a main course. Split between the four of us, however, it worked wonderfully -- a few sugary bites to cap off a splendid brunch. 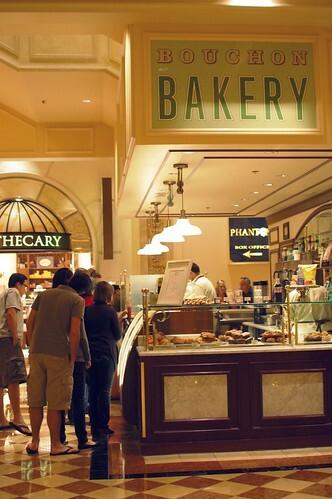 After brunch, we headed downstairs to the bakery to pick up some goodies to go. It's not hard to guess what was bought from this bakery. Another splendid meal! Your pictures are amazing, looks like such a lovely morning. I am also a nutella freak. and beignet freak. and waffle freak :) My idea of paradise! oh yum. 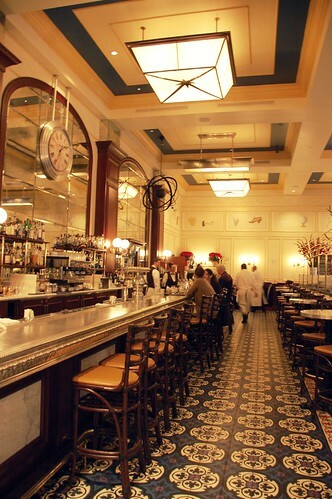 i still need to try bouchon for brunch. we always do dinner. 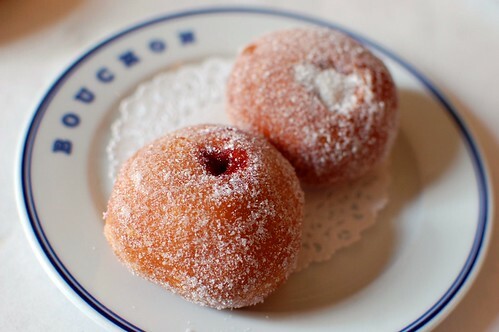 The raspberry beignets look delicious. I love how the necessity of tabasco factors into the egg critiques. you KNOW you had me at house-made doughnuts and NUTELLA spread. my word verification is "noboo." indeed. 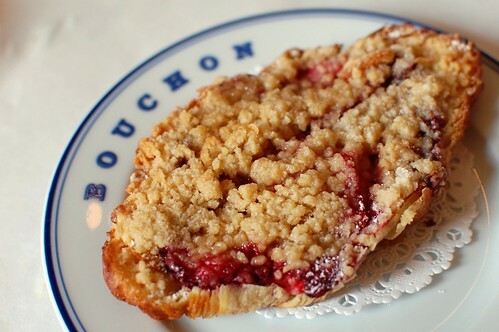 How insanely awful is it that I want nothing more than to wolf down that Bouchon French toast and will cutanybitch who tries to share? 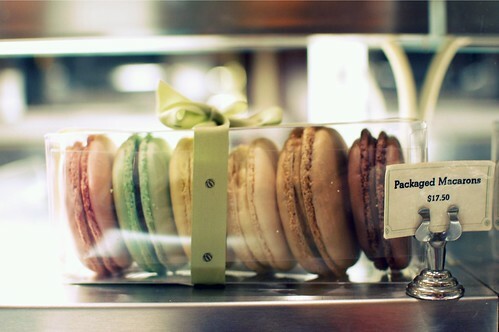 Carb lover's paradise! First off, I love you for the Lucky Charms “magically delicious” reference. Nicely done, Weezermonkey. LOL!! You got so many great shots. I think I love your breakfast posts the most. I freaking love breakfast/brunch. 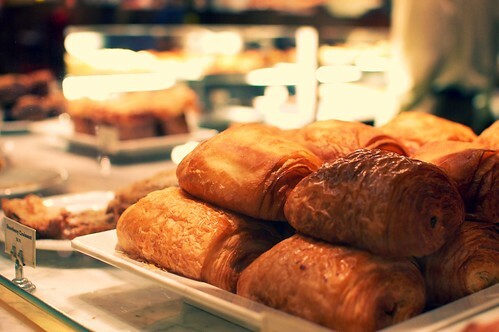 It’s funny that the strawberry croissant doesn’t resemble a croissant. At all. When I saw raspberry beignets, it made me think of the Prince song “Raspberry Beret”… And now I have that song in my head. 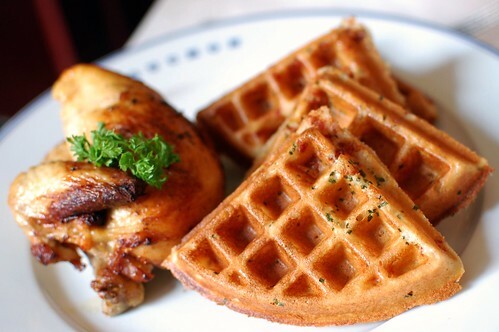 Now that I’ve seen your Bouchon chicken and waffles, I see why you scoff at Roscoe’s. But, I still want to try Roscoe’s one of these days! It's strange that I have no problem going to an overpriced dinner, but $26for a straight-forward breakfast entree just makes me want to go grab a bagel. Everything looked good . . . until that French toast literally took my breath away. I have GOT to try this someday. It looks magical. 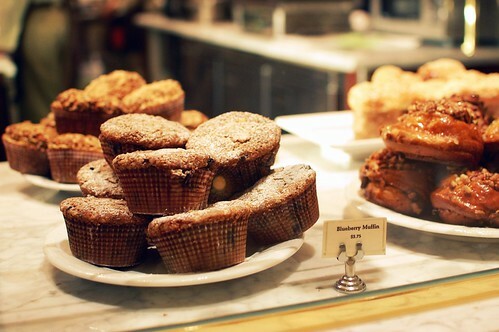 I love sweet breakfast items. 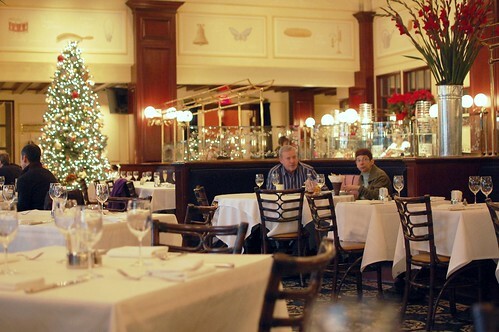 Jim loves their Steak and Eggs Benedict, I love their omelettes of the day and we're both gaga about the chocolate almond croissant and the raspberry beignets. Like GAGA!! 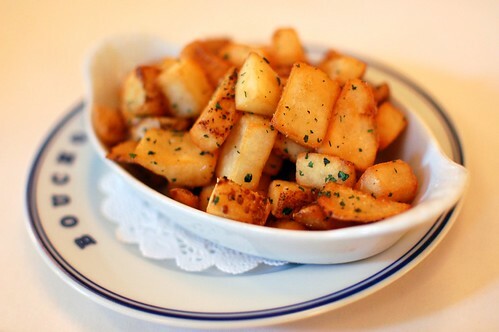 Oh and you're right, I don't know what kind of crack they put on those potatoes, but holy crap, they're AH-MAZING!! !